Life requires energy. Oil is finite. Life powered by oil is terminal..., before 2023. We have a choice, adapt or not. Admiral Rickover's 1957 speech on "energy slaves". Illicit Energy is dependence on energy outside self-reliance. Federal support for foreign oil exactly repeats the path to war of Federal support for slavery. 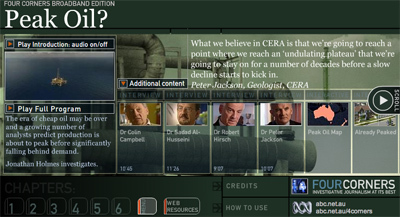 2005 ABC-Australia documentary on Peak Oil. Eight Presidents declaring oil addiction a threat to national security. Proved by oil-dollar funded terrorism and oil-wars. Five Presidential veto messages of why Federal oil-powered infrastructure is unconstitutional (Madison, Monroe, Jackson, Polk, and Buchanan). Fracking acounts for 65% of US oil production in 2016. Fracking production depletions. Fracking forecasts are unrealistic. Regardless of our wishes. Life requires energy. Oil is finite. The unconstitutional Federal highway monopoly binds the survival of American to oil. This oil addiction is terminal, by about 2019. Fracking is desperation, not a solution. 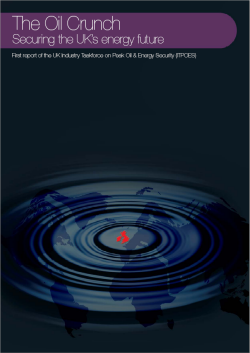 “Extraordinary advances in technology have transformed energy exploration and production. Yet we produce 39 percent less oil today than we did in 1970, leaving us ever more reliant on foreign suppliers. On our present course, America 20 years from now will import nearly two of every three barrels of oil–a condition of increased dependency on foreign powers that do not always have America’s interests at heart." US Peak Oil was in 1970. Life requires energy. Oil is finite. Life and nations powered by oil are terminal. Near collapse in 2008 will replay by about 2020. Peak Oil is not about a lack of oil; there is a lot of oil left in America. 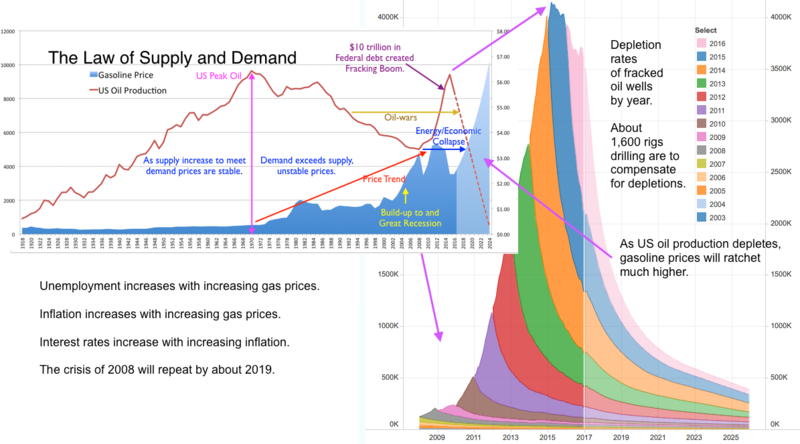 Peak Oil is the economic event when the cost to extract oil exceeds the price people afford to buy gasoline made from it. A Rig Count of about 1,600 was required to create the Fracking Boom. With the bankruptcies, rig counts dropped below 500. In July 2017 the Rig Count is at 958 (link to Rig Count). Fracking is "Running with the Red Queen", you have to keep running faster and faster just to remain in the same place. Link to graph source. Transfer of wealth from the US to the Middle East. As US oil production decreased the Federal government borrowed $18 trillion against the future labor of America's children to buy and defend access to foreign oil to power its unconstitutional highway monopoly (see Illicit Energy, Divided Sovereignty and Internal Improvements). Vast cities were built in the Middle East on this wealth. Funding of enemies with oil-dollars. Part of this transfer of wealth to the Middle East funded radical regimes and terrorism. Oil-wars and occupation of the Middle East since 1991 to secure access to foreign oil. With occupation, terrorists had a visible emblem to rally people to their cause with US oil-dollars suppling the money. Rising gasoline prices between 1998 and 2008. US families lost between $2,000 and $4,155 in disposable income (see metric of Disposable Energy). Incrementally families used their mortage payments to buy gasoline to fund their commute and keep their jobs. In September 2008 debt and foreclosures nearly world economy. Instead of solving the problem by exercising the self-discipline to become energy self-reliant, the Federal "bailout" borrowed an additional $6 and $14 trillion. The zero interest rates caused $200 billion to be invested in Fracking. Frackers, deploying 2,000 drilling rigs for years, used this investment to increase US Oil produciton by 5 million barrels per day (mb/d). When Saudi Arabia did not cut it production to match the US increase, oil prices dropped, Frackers went bankrupt and the number of drilling rigs dropped to 400. Fracking and recession bought time. US Peak Fracking was in June 2015. Since Peak Fracking, US oil production has been decreasing at 1 million barrels per day (mb/d) per year. This is the equivalent of one 1973 Oil Embargo. This rate of decline will continue for at least 3 more year. Before 2020, decreasing US oil production and increasing dependence on foreign oil will repeat the crisis of 2008. Life requires energy. Oil is finite. Life powered by oil is terminal. Logistics have mass and momentum. Like watching two ship on a collision, the crisis resulting from momentum is created long before the actual impact. Will experience a crisis exceeding 2008 by 2020 based on logistical momentum. We cannot avoid the crisis. We can mitigate the harm. Plant Victory Garden. Energy self-reliance starts with the self. If every America grows 1/3rd of their own food, the coming oil supply shock will be hard, but not a famine. Exercising self-discipline to be energy self-reliant is the solution. Defend the Constitution and our children, is to defend Liberty for Posterity. The Earth Belongs to the Living. End Illicit Energy, dependence on energy outside self-reliance. Federal support for dependence on foreign oil repeats the Path to War of Federal support for slavery. Restore transport infrastructure to free markets via the Performance Standards Law. Capitalize pollution and resource depletion costs into the price of using fossil fuels. Restore power generation to free markets with Feed-in-Tarriffs. Rates set based on pollution not created (point above and value of energy durability). The Stockdale Paradox: Unwavering faith that we will prevail while facing the most brutal facts of our current reality. The Lifeboat Paradox: Being self-disciplined to have and be skilled in the use of a lifeboat, reduces the need for a lifeboat. Surprisingly, it is 10x, ten times cheaper to be energy self-reliant. It is both very expensive and wasteful to move a ton to move a person. The nature of Peak Oil has been known since 1956. Removed energy efficiency as a market force. Caused the loss of nearly half (120,000 miles) of freight railroads. Freight railroads average 476 ton-miles per gallon. Subordinated the survival of America to a foreign power, a 50% dependence on imported oil. Caused national debt to increase in tandem with oil imports. Stifled innovations such as Morgantown PRT network. Admiral Rickover warned of the perpetual oil wars since 1991 in 1957. Peak Oil Discovery was in 1964. US Peak Oil was in 1970. Peak Prudhoe Bay in 1985. Peak Fracking was in 2015. American soldier have traded blood since 1991 to buy Americans time to exercise self-discipline to become independent of foreign oil. Americans have lacked the self-discipline to be energy self-reliant until Oil Famine looms by 2020. Volume: Oil availabiity expanding faster than demand. Price: Oil priced at $30 a barrel, gas at $1.45 a gallon. Quality: Net Energy of 20:1, 20 barrels available for every barrel used to get more oil. Growth: Oil supply will grow to support economic growth. Debt: What we cannot afford to pay for, we can borrow from the future. The Law of Supply and Demand requires prices to rise as supply diminish. Gasoline prices are highly correlated to unemployment two years earlier. Peak Fracking was in June 2015. Since zero interest rates in 2008 obtained $200 billion to invest in putting 2,000 drilling rigs into the field and nearly doubled US oil Production by 2015. Caused prices to fall. When Saudi Arabia did not cut production to match US increases, oil prices fell. Behind on bond payments, Frackers pumped faster so volume could compensate for low prices. $200 billion in debt selling $billion in assets. Spending 86% of their operating profits on debt trying to mitigate bankruptcy. Fracked wells deplete very fast. Rig counts have fallen from 2,000 to 400. Depletions are progressing at one million barrels per day (mb/d) per year. ​Link to EIA US Oil Production chart. May 2016 incredible forecast of US net energy exports by 2030. EIA failes to warn that it normally requires 40 to 200 years to retool a major infrastructure while it sister agency, IEA notes that production will meet needs based on "Fields Yet-to-be-found" and "Yet-to-be-developed". They also ignor that this "Yet to be" oil, requires $billions in capital investment into Exploration and Production (E&P) companies that are currently in bankruptcy. ABC Australia 2005 documentary with excellent interviews. The near collapse of the US economy in Sept 2008 was the last warning of the coming Oil Famine. The 2008-2015 situation in Syria illustrates what happens as cheap oil expands a country's population and revenues. Then oil production peaks, domestic consumption exceeds production, governments and populations crash into a Mad Max consequence we see with ISIS. The Syrian situation has been unfolding in the world since 1979. Per Capita energy peaked in 1979. Setting in motion a Mathusian collapse of the economy known as the Olduvai Gorge Theory. Our monolithic dependence on oil is similar to the Ireland's 1840 dependence on a single potato strain. Victory Gardens - personal responsibility for self-reliance. JPods and other Performance Standards transportation systems to increase efficiency 10 to 100 times. Feed-in Tariffs - allowing small businesses to generate and sell electricity to increase efficiency 10 to 100 times. Saudi Arabia to run out of cash in less than 5 years. Saudi Arabia May Become Oil Importer by 2030, Citigroup Says (note CitiGroups largest shareholder is from Saudi Arabia). Saudi Arabia announced a $2 trillion "Post-oil Era" fund to move their economy off oil as they face Peak Oil. Disposable Energy should replace GDP as a metric of government performance on the economy. US poverty levels are climbing. Four of the last five global recessions were caused by huge spikes in oil prices and the world economy is coming off the mother of all spikes. 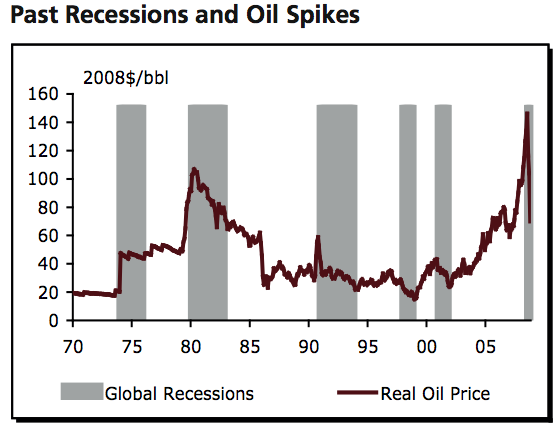 Over the past expansion, real oil prices rose over 500%, twice the climb in real oil prices that produced the two biggest recessions in the post-war era: the 1974 recession and the double-dip recession in 1980 and 1982. If oil shocks half the size of the recent one caused the worst recessions in the last fifty years, they're a pretty obvious explanation for the recessions in oil-dependent Japan and Euroland earlier in the year. From where the US economy currently stands, vehicle sales have a much bigger downside than housing starts.